Robert J. Sternberg has been studying relationships for decades and is one of the most sought-after experts on long-term intimate relationships. Part of what makes Dr. Sternberg celebrated is his development of the ‘Triangular Theory of Love.’ Sternberg’s theory consists of three parts: intimacy, passion, and decision/commitment. Intimacy is the feeling of closeness, connectedness, and bondedness in loving relationships. It is used to describe the loving warmth that’s so critical to relationships. Passion, as Sternberg describes it, are the drives that allow physical attraction, sustained sexual desirability, and psychological manifestations of romance and seduction. Decision/commitment refers to the decision that a person makes when they love a person, and decide to maintain that love via a long-term, intimate relationship. Decision and commitment are not necessarily mutually-inclusive; one can feel, acknowledge, and make the decision to love someone without desiring to sustain a long-term commitment. While all three parts of the love triangle are crucial to an intimate relationship, no such thing would be possible without the foundational feeling of warmth. Intimacy is what stimulates and maintains the other two corners of the triangle. But intimacy, as anyone who has been in a long-term partnership, can attest, may ebb and flow. Not to fear! Here are ten proven ways to boost intimacy, according to psychologists. Some couples are mismatched, in that one craves deeply open communication while the other does not. The fact is the latter will likely never be entirely at ease with expressing poignant verbal niceties. The good news is that as long as the topics of communication are emotionally ‘safe’ – as in no digging for emotional ‘skeletons’ – then your partner will eventually become a bit more warm and free with their dialogue. Sometimes it’s easy to take our partner for granted. The little things they do for us are often overlooked after a certain period of cohabitation. But it doesn’t mean that these things are not necessary. Make it a point to tell him or her how much you appreciate them. It feels really, really good – and it’ll add some positivity to your relationship. It is only natural that our partner becomes more predictable. At first, there’s all this new stuff to learn – and it’s really exciting! Then, a little maneuvering around each person’s routine before it becomes, well, routine. But intimacy is all about enjoying the humdrum. The monotonous creates the intimacy, and the routine sustains it. 4. …and then shake things up! Few things are more intimate than the unexpected. While it’s true that routine weaves with intimacy, novelty provides the spark. Sometimes, all that’s needed to jumpstart the intimacy engine is to find a new path for the current to flow. If you absolutely must walk away from someone, you’ll know it. But if the thought comes and goes, be aware of the risks of a hasty retreat. Communication is often the bugaboo of relationships. Coincidentally, walking away is too often the result. Do what’s necessary, but do yourself a favor and avoid taking the easy way out. If that means sitting in a room for hours brainstorming a resolution, then so be it. If you – like so many – have embraced the comfort of relationship silence, try and get the conversation flowing again! Continued intimacy may hinge on the willingness to disclose more and welcome new topics of discussion with open arms. Sharing your thoughts is what intimacy is all about. Sit down at the end of the day, hold each other’s hand and just share. 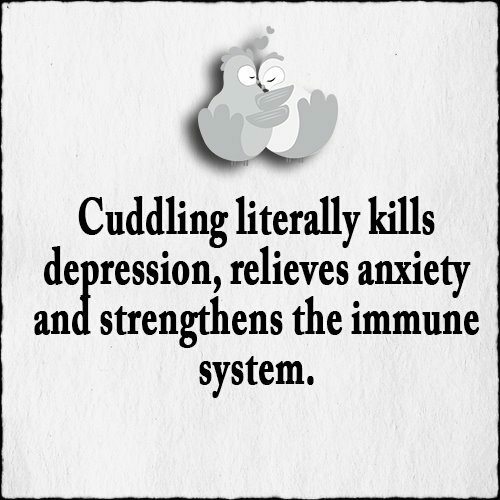 Holding each other for 15 minutes everyday floods the body and brain with feel-good hormones, including the “love hormone” oxytocin. According to one study, 94 percent of couples that went to bed together holding each other reported feeling happy; compared to just 68 percent for those who did not. According to a study published in the Journal of Personality and Social Psychology, researchers found that couples who mutually engage in an exciting physical activity or challenge report feeling more satisfied with their relationships and were more in love with their partner. We’ve all heard the axiom “Laughter is the best medicine.” If you peek inside what happens in the brain when we enjoy a hearty giggle, you’ll understand why. The physical act of laughing triggers the release of endorphins – the brain’s natural opioid. The chemical changes that occur in the brain while laughing – and even afterward – strengthens a couple’s emotional bond!